It looks as if some of the upcoming packages and figures have been spilled out onto the web. This isn't from an official Disney announcement, although rumors and pics of the Tron figures have been out there for quite a while, but the new wave has some interesting characters. Olaf from Frozen, Sam and Quorra from Tron Legacy, Mulan (YES! ), and even a couple characters from Pixar's upcoming film Inside Out. We finally have some fairly concrete proof of the Disney Infinity 3.0 lineup. Out of respect for the series I'm only posting a part of the pic of the box, and not the whole images. Disney Infinity's support team has been very quick and nice to me and I would like to keep it that way. 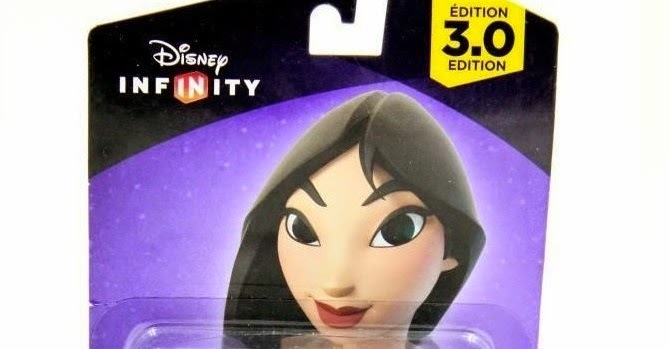 Of course the first thing I noticed on the back of the Mulan package is the fact that like 2.0, series 3.0 will be incompatible with previous versions. However, this fact won't be too bad if they make 3.0 able to play the older figures and playsets. I would like more continued play with my old stuff, and not being able to play the Pirates of the Caribbean set on 2.0 is a large complaint. In addition I've been seeing tons of pics and hints of Disney focusing on Star Wars as the base series, where 2.0 had a Marvel theme. I've seen potential figures, and tons of in game hints such as the iconic Star Wars lightsabers and landspeeders showing up in the Toybox games. I just want to see many more playsets with campaigns and stories to play through. Anyways, speculation is that the series 3.0 products will be available with plenty of time for the upcoming Star Wars movie The Force Awakens to capitalize on sales well before Christmas. Hopefully it'll be long before that though.